A mother and daughter, Mrs.Pinky Maheshwari and Mrs.Sharda Daga started a creative company together to give surprises and spread smiles. Surprise someone offers gift items made of recycled paper that embedded with seeds. Everybody loves to receive and give surprises. A perfect gift can lift the mood, bring happiness and make a lovely moment with someone. Customizing gifts and selling is already in culture but what is unique about the surprise someone gifts. Innovation and creativity together can help to reduce paper waste and promote more plantation of trees. With these two ingredients, pinky came with the idea of making crafts and gifts from recycled papers. These gifts are not to throw after using them enough. As every gift can grow into a beautiful plant or tree. Recycled Seeded Paper: A surprise element of Surprise someone. Pinky Maheshwari holds an MBA degree and before starting her own venture, worked for eight years in Ogilvy & Mather and two years with Vodafone Rajasthan. After getting married and having a baby, she decided to turn mompreneur and fulfill her dream of launching a venture connected to something she was known for even in her corporate days – giving surprises. Pinky and Sharda came up with the idea when pinky got the ordered of 150 handmade and exclusive welcome card for a corporate event. Her first check was of 15000 and till now she is making via recycled pieces of paper. Pinky plays the role of CEO, where she takes care of the execution, sales, advertising and marketing of products at the national and international level. Her mother manages the warehouse and manufacturing unit as well as lookout for new talents and artisans from rural areas. Surprise Someone founded in 2015. 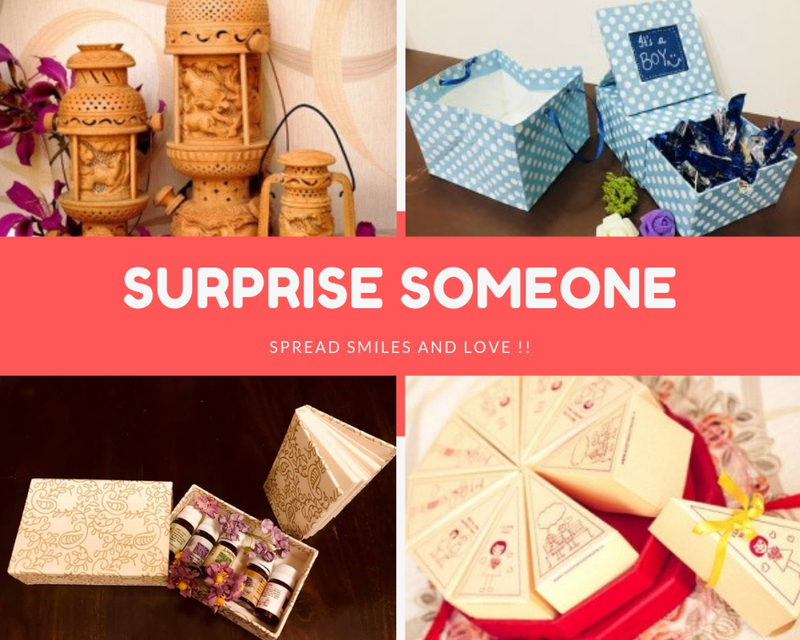 It manufactures gifting products from recycled handmade and plantable seed paper. These recycled paper made from cotton rags/ waste cotton and 100% biodegradable material. Along with this, recycled paper embedded with seeds of several plants –herbs like basil or rosemary, flowers like marigold or roses, vegetables like coriander or green peppers etc. Gifting products of recycled paper can spread happiness and awareness of saving trees among people. Surprise Someone has a catalog of 1200 products which all are made from recycled paper. This venture till now has a team of 10 employees and 40 designers from cities and rural areas. They never took any help from an investor or any loan for funding their startup. They believe in the bootstrapped funding model as it exists for the long run. In fact, they generated a revenue of Rs. 25 lakh in 2017-18 and still growing exponentially in the business ecosystem. They have made the base in Walmart and distributed many products to huge food industrialists like Halidram and Silver leaf. Till now, surprise someone is serving a client base of over 5000 without spending on advertising and marketing extensively via social media platforms like Facebook, Instagram, Twitter, Google Plus, and LinkedIn helped them a lot. Right now, Surprise is empowering hundreds of women from rural areas by helping them make paper bags, boxes, and other products from recycled seeded paper. Anyone who is using the product of surprise someone, promising nature to plant trees and save trees from cutting down all because of paper. So Now, buy a gift for your someone special and grow a plant to make a clean and beautiful environment.